Vulcathene Chemical Drainage from Durapipe UK has recently been utilised as part of the development of the Quadram Institute, a food and health research facility in Norwich Research Park. 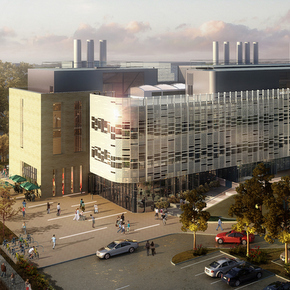 The new £64m facility will house over 20 laboratories, making a reliable pipework system vital for chemical drainage. Working alongside main contractor, Wates Construction, leading national engineering specialist SES Engineering Services (SES) was responsible for the installation and commissioning of all MEP services across the project. Gowing and Hunt were tasked with the installation of the Vulcathene Chemical Drainage pipework system. Vulcathene Enfusion pipe and fittings were installed across the two floors in sizes from 38mm up to 102mm, to transport chemical waste from the fume cupboards and sinks in every laboratory, through to the drainage stacks before being disposed of off site in the main underground sewer. Vulcathene offers health and research establishments the reassurance that it has a proven pedigree over many decades in dealing with all manner of chemical waste cocktails from laboratories across the world. Vulcathene is a purpose designed chemical drainage system available in two easy jointing methods; Mechanical for demountable joints and Enfusion for welded joints, offering complete flexibility for designers and installers of chemical waste systems.